Among my investment portfolios, P2P is part of it. For those who might not be familiar with P2P, it’s basically peer to peer lending. Companies who might need access to working capital will look for loans from P2P platforms. These P2P platforms will then profile the risks of these companies and then determine if they want to help these companies raise funds from retail investors. The P2P platform I’m using now is funding societies. So every week, funding societies will publish loans for retail investors to back. As retail investors, you can look at the company profiles and see if you want to loan your money to them for X period at X interest rates. Usually the tenure is around 12-24 months, with interest rates ranging from 10-18%. You can back from as low as S$50 to as high as S$500,000. For high interest rates loans, Funding Societies might also cap the max amount of loan you can back / invest. An return / interest rate of 10-18% is not bad – considering REITs typically give out an annual dividend of around 6-8% depending on which REIT. Why the interest rates are high is because, normally these companies would have exhausted other means of financing, or banks / other financial institutions may not be willing to extend their loans to these companies due to high risk / bad credit ratings. Hence they turn to P2P platforms to look for capital financing. In return for taking the risk (default risk), retail investors are given a high interest rate for backing them. So I’ve been with funding society for almost a year now, and the repayment rate is at 99%, with zero defaults, which is acceptable given my realized annualized return is at around 9-10% now. That’s to say, almost every companies are paying back their loans on time. Or rather, Fundjng Societies has done a great job in assessing the risk of these companies they endorse on their platform. Through funding societies, I also realized that there are a lot of cash rich retail investors. 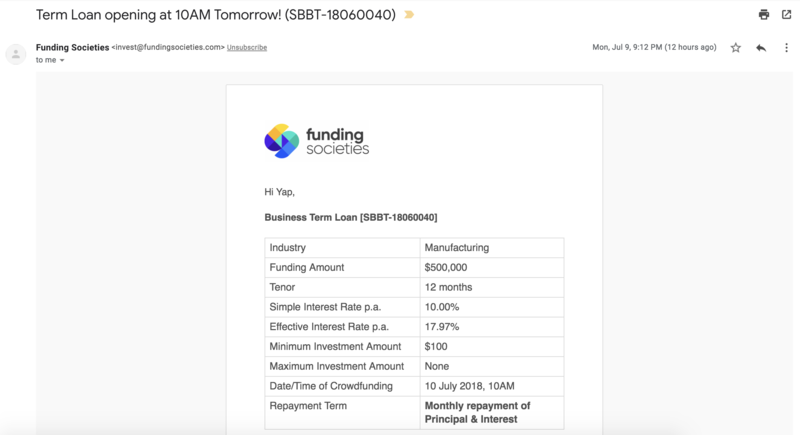 This is an email notification to notify all investors that there will be a loan available for public backing on 10th July 10am, sent to everyone the night before. When I logged onto the platform at 10.01AM, the loan is fully backed by the users on the platform! That’s S$500,000 of fund commitment in just 1 min! Somemore this particular loan is not that great as the simple interest is normal than the usual loans that FS opened up to everyone, and the company looking for loan is facing a revenue and margin decline in the last FY, hence I perceived it as one with a higher default risk. But wow – so many cash rich retail investors in Singapore!